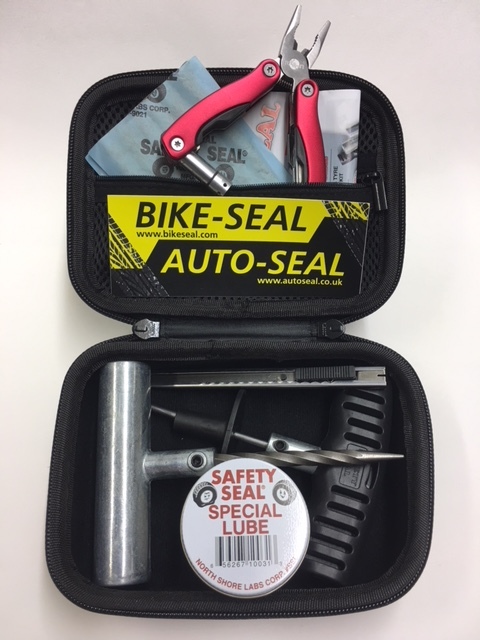 Premium, space saving, lightweight, multi-purpose kit for durability, safety and ease of use in any situation. All items can be replenished. T.U.V tested in Germany according to ECE R30 (car) at speeds over 300 kmh (180 mph) and ECE R54 (HGV) i.e. Same standards used to approve new tyres. Each Safety Seal repair is composed of 21 plies of high tensile synthetic yarn. Each yarn is immersed in a vulcanizable, butyl rubber sealing compound until 300% its own weight is deposited on the yarn. Coated yarn are twisted to form the Safety Seal repair. This unique rubber mixture gives a perfect seal, ensuring no air leakage or water ingress. Safety Seal repair has a shear strength up to 160 kg. Safety Seal has undergone intense high speed and endurance tests. Conducted by independent testing both in the United States and Europe (T.U.V). 6-10 years shelf life – storage dependent . 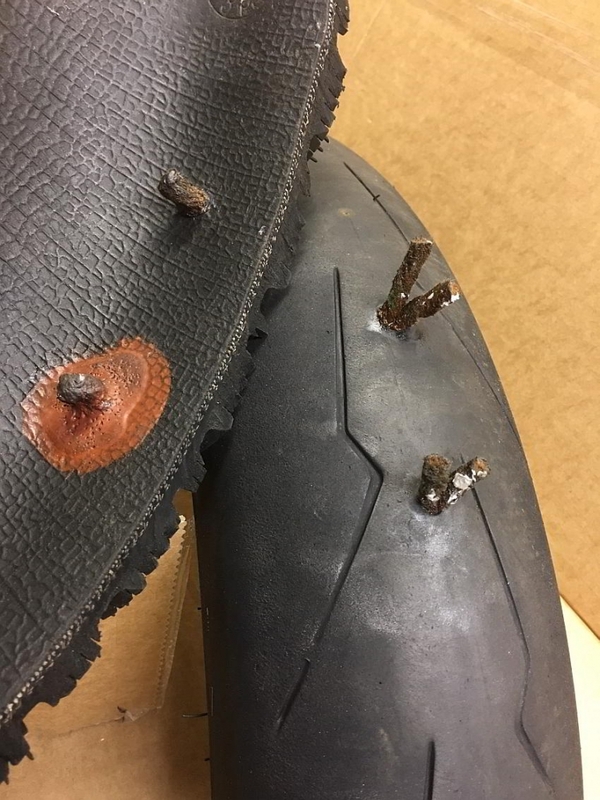 Tyre damage through the steel cords must be repaired ASAP. Failure to do this will result in moisture and therefore rusting of the steel cords, leading to delamination. Safety Seal repairs prevent moisture from penetrating, even with irregular shaped or angled damage. 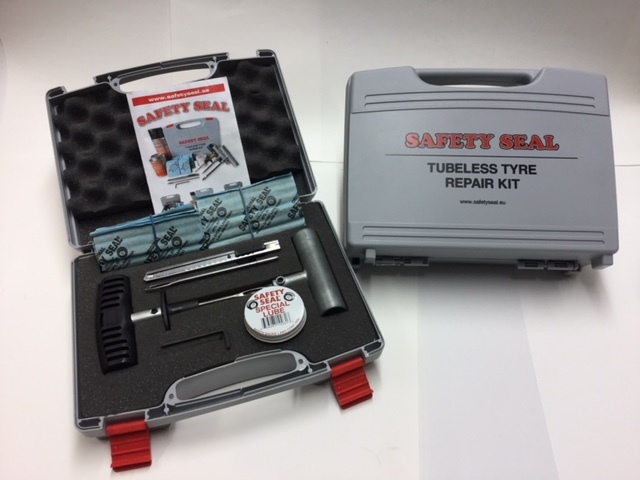 The construction of Safety Seal’s multi-plie plug ensures a high self-vulcanising rubber content can completely encase the steel banding within a damaged tyre; whilst allowing it to be pushed / pulled through the wound, without stripping the self vulcanizing butyl solution from the multi-plie plug. Immitations do not achieve this, instead leaving a rubber compound on the surface of the damaged tyre. Safety Seal repairs fill and seal the entire damage regardless of how it is shaped, due to the multi-plie construction. The loop formed on the inside of the tyre constitutes an effective seal against the inner seal of a tyre. If commercial installation is required , a butyl liquid rubber patch can be applied internally. This is available separately or in conjunction with a commercial kit. and lasts for the life of the tyre.